Have you ever been on the verge of something brilliant when you were suddenly interrupted? In a different vein, have you ever read a story and felt like, between the lines, you gained insight into current events in the writer’s life? A few weeks ago my mom was here. With her she brought a small box which held random papers and things from long ago that belonged to me. To be honest, I’ll get rid of most of it, but I did happen upon something a little different than the other forgotten-significance artifacts. 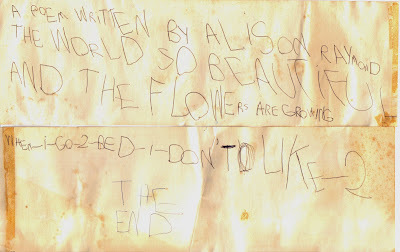 My highly-honed handwriting analysis skills tell me that I penned this around age five or six. I’ve had a request for more poetry; I hope this gives some intellectual satisfaction. Can’t a writer catch a break? Speaking of breaks, I hope everyone has a good weekend. This is what you’ve been waiting for: After a much-debated contest, (drumroll) “The Eye of the Tiger” has emerged as the champ of the Best 80s Song poll. Rest assured that I will notify and congratulate Survivor immediately. Some disagreement did surface during this intense debate, however. Some of you suggested that perhaps the best 80s songs didn’t have a chance because they weren’t listed. Well, here’s your chance! Tell me what songs you DO think should’ve been on the list. …And as much as you might be tempted, don’t try to suggest anything by Menudo, please. While you’re thinking please check out the new poll, below and left.